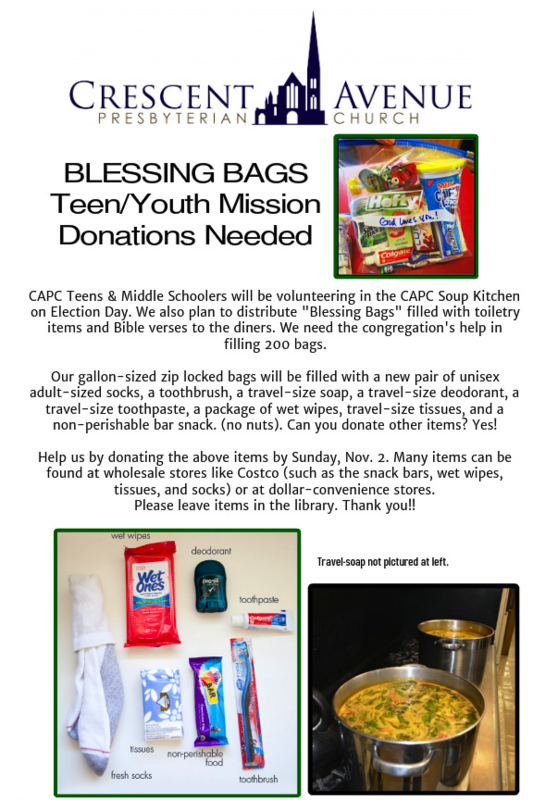 The teens and middle school students are accepting donations until Sunday, Nov. 2, for items to fill our Blessing Bags. The bags will be distributed to CAPC Soup Kitchen guests on Election Day 2014. Items include new donations of pair of socks, toothbrush, travel-sized soap, travel-sized deodorant, travel-sized pack of wet whipes, non-perishable (no nuts) bar snacks, and travel-sized tissue packs. Donations can be provided to the church office and marked "youth blessing bags donation." See flier below for additional detals.